Refinance volume, which tends to be the most rate-sensitive, dropped 2 percent for the week and is down nearly 34 percent from a year ago, when interest rates were lower. 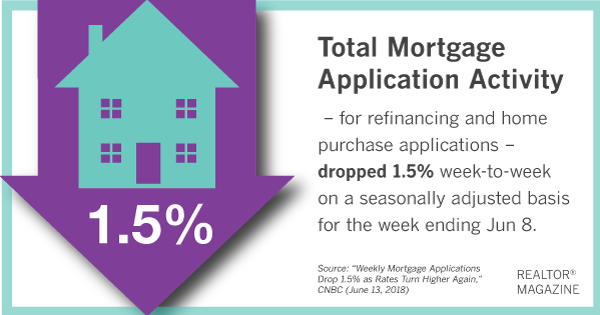 Mortgage applications for home purchases also dropped 2 percent for the week but are just 0.2 percent lower than a year ago, the MBA reports. This is one of the few times this year that purchase applications have been down on an annual basis. Economists note that a severe shortage of homes for sale may be more of an issue for home buyers than the uptick in interest rates, however. The 30-year fixed-rate mortgage averaged 4.83 percent, up from 4.75 percent the week prior, the MBA reports. Mortgage rates are near seven-year highs. That could soon change. The Federal Open Market Committee raised its lending interest rate on Wednesday afternoon by 0.25% to a range of 1.75%-2%, the highest since September 2008. Update: This story was updated with details of the interest rate increase and reaction from NAR Chief Economist Lawrence Yun.